Synonyms and Other Names: Pelodryas caerulea, White’s treefrog, dumpy treefrog. Identification: A large, green, arboreal hylid (treefrog) with large toepads (disks) for climbing. Dorsal color ranges from a distinct jade green, blue-green or olive, with occasional white markings or indistinct stripe on sides (Tyler et al., 1984; [Frith] and Frith, 1987; Hoser, 1989; Bartlett and Bartlett, 1999; Cogger, 2000; also illustrated in Mattison, 1987a, b; Davies and Davies, 1997; Lamar, 1997; Krysko et al., 2011: MorphoBank M88446, www.morphobank.org, Project Number p536). Size is about 100-150 mm (3.9-5.9 in) (Hoser, 1989; Bartlett and Bartlett, 1999; Cogger, 2000). 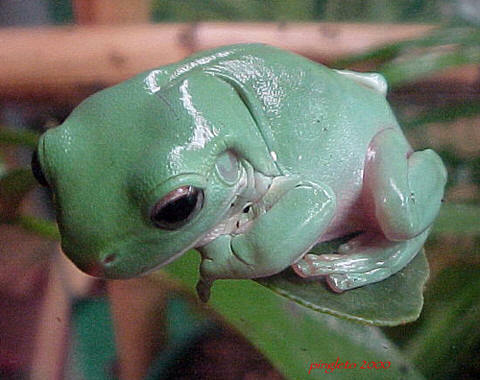 No other indigenous treefrog in Florida reaches such a large adult size or is jade green. Moreover, these would be the only treefrogs in Florida with a distinctive, lumpy or fleshy fold behind each eye, sometimes partially covering the tympanum (eardrum) (Tyler et al., 1984; Hoser, 1989; Bartlett and Bartlett, 1999; Cogger, 2000). Call is a distinct, deep barking or nasal “wark-wark-wark” (Tyler et al., 1984; Hoser, 1989). Size: snout-vent length of 100-150 mm (3.9-5.9 in). Native Range: Most of northern and eastern Australia, and southern New Guinea (Tyler et al., 1984; [Frith] and Frith, 1987; Hoser, 1989; Tyler, 1989, 1999; Cogger, 2000). Table 1. States with nonindigenous occurrences, the earliest and latest observations in each state, and the tally and names of HUCs with observations†. Names and dates are hyperlinked to their relevant specimen records. The list of references for all nonindigenous occurrences of Litoria caerulea are found here. Means of Introduction: Pet industry escapees and intentional releases (Bartlett, 1994; Bartlett and Bartlett, 1999; Krysko et al., 2011). Great green treefrog breeding programs in Florida sometimes utilize orchid shade houses to breed frogs for the commercial pet trade (Bartlett, 1994). Status: Butterfield et al. (1997) and Powell et al. (1998) uncritically list L. caerulea as established in Florida despite the lack of physical evidence. However, there is no evidence of established populations in Florida (Meshaka et al., 2004; Krysko et al., 2011). Impact of Introduction: Unknown. These large, insectivorous frogs may potentially compete with native frogs and can easily swallow Florida’s native hylids and other small vertebrates. It is not known if their aquatic tadpoles can impact indigenous aquatic wildlife. Bartlett, R. D. 1994. Florida’s alien herps. Reptile & Amphibian Magazine (27):56-73, 103-109. Bartlett, R. D., and P. P. Bartlett. 1999. A Field Guide to Florida Reptiles and Amphibians. Gulf Publishing Company, Houston. 280 pp. Bell, B. D. 1982. The amphibian fauna of New Zealand. Pp. 27-92. In: D. G. Newman (editor). New Zealand herpetology. New Zealand Wildlife Service Occasional Bulletin (2):1-495. Butterfield, B. P., W. E. Meshaka, Jr., and C. Guyer. 1997. Nonindigenous amphibians and reptiles. Pp. 123-138. In: D. Simberloff, D. C. Schmitz, and T. C. Brown (editors). Strangers in Paradise. Impact and Management of Nonindigenous Species in Florida. Island Press, Washington, D. C. 467 pp. Cogger, H. G. 2000. Reptiles & Amphibians of Australia. Sixth Edition. Ralph Curtis Publishing, Sanibel Island, Florida. 808 pp. Davies, R., and V. Davies. 1997. The Reptile & Amphibian Problem Solver. [North American Edition.] Tetra Press, Blacksburg, Virginia. 208 pp. Duellman, W. E. 1993. Amphibian species of the world: Additions and corrections. University of Kansas Museum of Natural History, Special Publication (21):1-372. Faivovich, J., C. B. F. Haddad, P. C. A. Garcia, D. R. Frost, J. A. Campbell, and W. C. Wheeler. 2005. Systematic review of the frog family Hylidae, with special reference to Hylinae: Phylogenetic analysis and taxonomic revision. Bulletin of the American Museum of Natural History 294:1-240. [Frith], C., and D. Frith. 1987. Australian Tropical Reptiles & Frogs. Tropical Australian Graphics, ‘Prionodura’ Paluma via Townsville, Queensland. 71 pp. Frost, D. R. (editor). 1985. Amphibian Species of the World. A Taxonomic and Geographical Reference. Allen Press, Inc. and The Association of Systematics Collections. Lawrence, Kansas. 732 pp. Frost, D. R., T. Grant, J. Faivovich, R. H. Bain, A. Haas, C. F. B. Haddad, R. O. De Sá, A. Channing, M. Wilkinson, S. C. Donnellan, C. J. Raxworthy, J. A. Campbell, B. L. Blotto, P. Moler, R. C. Drewes, R. A. Nussbaum, J. D. Lynch, D. M. Green, and W. C. Wheeler. 2006. The amphibian tree of life. Bulletin of the American Museum of Natural History 297:1-370 + Fig. 50 foldout. Hoser, R. T. 1989. Australian Reptiles & Frogs. Pierson & Co, Sydney. 238 pp. Hudson, B., and T. J. Thornton. 1994. Reptiles & Amphibians in New Zealand: Handbook for Species Identification. Print Media Specialists, Auckland. 50 pp. Kraus, F. 2009. Alien Reptiles and Amphibians. A Scientific Compendium and Analysis. Springer, [Dordrecht]. 563 pp. + CD-ROM. Krysko, K. L., J. P. Burgess, M. R. Rochford, C. R. Gillette, D. Cueva, K. M. Enge, L. A. Somma, J. L. Stabile, D. C. Smith, J. A. Wasilewski, G. N. Kieckhefer III, M. C. Granatosky, and S. V. Nielsen. 2011. Verified non-indigenous amphibians and reptiles in Florida from 1863 through 2010: Outlining the invasion process and identifying invasion pathways and status. Zootaxa 3028:1-64. Lamar, W. W. 1997. The World’s Most Spectacular Reptiles & Amphibians. World Publications, Tampa. 208 pp. Mattison, C. 1987a. Frogs & Toads of the World. Facts on File, Inc, New York. 191 pp. Mattison, C. 1987b. The Care of Reptiles and Amphibians in Captivity. Revised Edition. Blandford Press, London. 317 pp. Meshaka, W. E., Jr., B. P. Butterfield, and J. B. Hauge. 2004. The Exotic Amphibians and Reptiles of Florida. Krieger Publishing Company, Malabar, Florida. 155 pp. Powell, R., J. T. Collins, and E. D. Hooper Jr. 1998. A Key to Amphibians & Reptiles of the Continental United States and Canada. University Press of Kansas, Lawrence. 131 pp. Robb, J. 1986. New Zealand Amphibians and Reptiles in Colour. Revised [Edition]. William Collins Publishers Ltd, Auckland. 128 pp. Tyler, M. J. 1989. Australian Frogs. Viking O’Neil, Penguin Books Australia Ltd, Ringwood. 220 pp. Tyler, M. J. 1999. Distribution patterns of amphibians in the Australo-Papuan region. Pp. 541-556. In: W. E. Duellman (editor). Patterns of Distribution of Amphibians. A Global Perspective. The Johns Hopkins University Press, Baltimore. 633 pp. Tyler, M. J., L. A. Smith, and R. E. Johnstone. 1984. Frogs of Western Australia. Western Australian Museum, Perth. 109 pp. Wright, K. M., and B. R. Whitaker. 2001. Amphibian Medicine and Captive Husbandry. Krieger Publishing Company, Malabar, Florida. 499 pp.